Enter here To qualify for the affiliated discount you must register using your membership number. When entering events, each transaction must be per competitor. Entries will be open between 1st November 2018 (midnight) - 11th August 2019 (12noon), unless full prior to this. This event sold has been a sell out every year since 2015 with many people missing out on a space. Watch: Cotswolds Lake 62 Marathon Swim 2018. 10km marathon swim - 08:45am - click here. 3.8km swim - 11:00am - click here. 1.5km swim - 12:00 - click here. Don't fancy the swim? Why not try the North Wiltshire Sportive - click here. 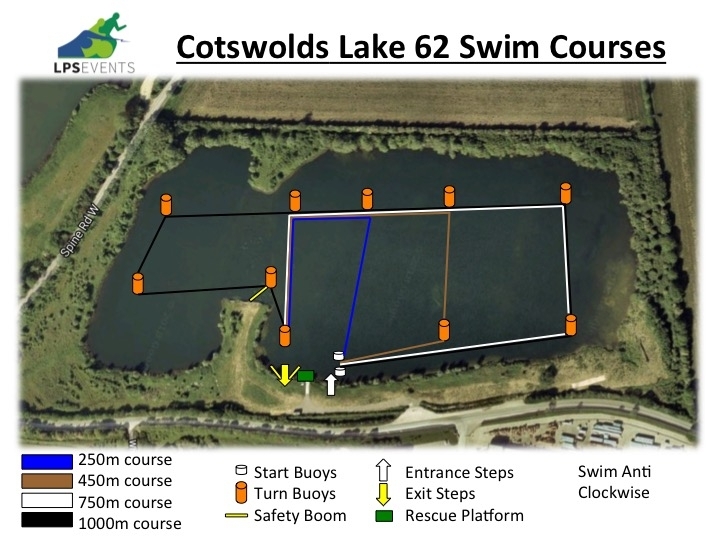 The swim will take place in the beautiful lakes of the Cotswolds. The event will be a deep-water start with all swimmers in the race starting together. There will be timed splits for each 1km of the course via a timing chip on your wrist (tagging the pontoon on each lap). There is the option for a self fuelled feed station at each km too. After a review of the 2018 event, we will no longer be helping you count your laps on the 5km swim. You will be able to register for the event and pick up your timing chip before your start time. You will be required to show photographic identification or your confirmation email to verify whom you are when you register on the day. Race registration will be open between 08:15 and 08:45 on the day. Ample free parking will be available within a 5-minute walk of the venue. If you require disabled parking, we have limited availability closer to the venue, please contact us prior to arrival. Travel times by car vary, however as a guide you can get here from the following cities by google maps. The nearest motorway junction is J15-J17 on the M4. We can offer camping for this event to stay on Saturday 18th August. Toilet facilities are on site, however there are no showers. A fee of £5 per pitch is payable and pre booking is essential. Please get in touch if you wish to book a spot. South West Sports Massage will be in attendance for this event. They will be on site for pre and post race massage for anyone who needs a little loosening up. There is a small fee of £5 for 10 minutes or £10 for 20 minutes. CoffeeGang is an award-winning mobile coffee van supplying bean-to-cup fairtrade Colombian coffee. Additionally we supply dreamy hot chocolate sourced in the Dominican Republic and a variety of teas, milk shakes and soft drinks. Our home-made cakes always go down a storm too. See you at the race finishing line! Charles Whitton Photography will be providing race coverage for this event. Visit his page for more information. Presentations will take place towards the end of the event once all the waves have started. This is anticipated to be around 12:00pm or soon after. Winners trophies will be awarded to the following; 1st, 2nd & 3rd male and female overall. 1st in the following male and female categories: Vet 40+, Vet 50+, Vet 60+ & Vet 70+. Results will be available shortly after the event and uploaded onto LPS Events website under the results page. There will be a link to the event photographs from the results page also. Our press report will appear on our news page a few days after the event. You can enter through our website using your PayPal account or a credit card. If you require a postal entry, please contact us. Entries on the day for this event will not be accepted. A cut of time of 4 hours is set for this event. A copy of the British Swimming rulebook can be found here. Please familiarise yourself with the rules to prevent disappointment on the day. As soon as we receive your entry for this event, the money is budgeted towards the successful delivery of this event. For this reason refunds will not be permitted once you have entered. You can view our policies here. By signing up to this event you are agreeing to these policies and understand that refunds are not possible. For your entrance fee, you will receive a bespoke medal, designed especially for this event. Electronic timing is available for the event and you will receive electronic split times for the event. You will have access to a free online training programme and also you will be part of the 2019 Cotswolds Marathon Swim. Lake 62 is a privately owned well kept lake in the Cotswolds. This lake has been unused for many years, keeping it one of the finest. Its size and shape allows for some great spectating at all our events here and provides a base for triathletes wishing to take part in a medium sized event on a flat profile. We also host training and coaching sessions from this lake, for further information about these days, please see the training page here. You should ensure that you train your body for endurance swimming events and build up your stamina. This will enhance your overall fitness. A combination of strengthened joints and also fitness will aid in your successful completion of this event and assist with your recovery after the event. As you will be swimming for a long period of time, you should ensure that you train for the event by undertaking some longer swimming sessions and ensure that you combine pool swimming with open water practice. We also recommend that you trial your race nutrition prior to race day. Download a free training programme for this event on our coaching page. No events in your cart.